GIA announces the release of a comprehensive global report on Bakery Products markets. The global Bakery Products market is forecast to reach US$447 billion by the year 2017, driven by new consumer preferences for conveniently portioned and easy-to-consume bakery goods. Increasing migration from the rural to urban areas is causing an increase in demand for convenience foods such as breads, pastries, cakes, and biscuits. Deli and in-store bakery goods are exhibiting increased growth, while consumers shift away from meat and packaged goods. Donuts, specialty breads, pizza and gourmet are among the fastest growing product categories. Manufacturers are concentrating on display and dressing of their bakery products in order to increasingly attract today’s discerning consumers. Modern-day consumers operate around hectic schedules and are unable to indulge in leisurely meals; hence, satisfying and handy snacks such as pocket sandwiches and wraps are rising in popularity. Also, persistent changes in workforce participation and attitudes, as well as growing incomes, have led consumers to emphasize more on convenience. Time-strapped women consider bread as a more convenient alternative to other staples, such as rice, which require substantial preparation time. Even among breads, the newly introduced “buttery” breads, which require no additional butter, are gaining a noticeable share in the market, at the expense of traditional loaf bread. Development of packaging that suits the changing lifestyles of consumers is another significant factor driving value in the market. Development in packaging would lean toward snack-focused and single-portion packaging as well as on miniaturization. Innovations in packaging that are expected to kindle consumer demand over the forecast period include re-sealable packaging and smaller bread loaves. The bakery products market in developed regions such as North America, and Western Europe is comparatively matured, and future growth is forecast to be derived primarily from the emerging markets of Asia-Pacific, Latin America, Eastern Europe, and the Middle East. Encouraging economic prosperity, increasing disposable incomes, higher living standards, rising employment rates, and shifting lifestyles resulting from cultural changes, are providing an impetus to bakery products in these markets. Consumption of Cakes is rapidly proliferating in Asia, while biscuits are leading in terms of sales gains in Eastern Europe. Developing markets offer higher potential for greater market penetration, and rise in per capita consumption, while in the developed markets, innovation in new flavors and healthy ingredients will add to consumption frequency. For instance, in Western Europe, rising sophistication in flavor preferences drives the market. Europe comprises the largest regional market worldwide, as stated by the new market research report on Bakery Products. The United States and Latin America succeed Europe as the next important markets in terms of overall size. However, with respect to the long term growth potential, the Asia-Pacific market is projected to take the lead, expanding at the highest CAGR of 6.0% through 2017. Segment-wise, Bread/Rolls represent the largest segment globally, followed by Cakes/Pastries. Morning Goods is expected to emerge as the fastest growing product segment through 2017, growing at a CAGR of 5.0% over the analysis period. Southeast Asian countries offer robust business prospects for bread manufacturers. China, Hong Kong, and Malaysia, for example, are experiencing a boom in the Bread business. Strong economic growth, rising standards of living, increasingly westernized lifestyles, and reduced time to prepare elaborate home cooked meals/breakfast, are some of the factors responsible for the spurt in growth in these markets. Numerous new bakeries have been established in China and Hong Kong over the last few years, reflecting the growing popularity of bakery products in general. The bakery products industry caters to a vast consumer segment ranging from 5-year old toddlers and upwards, and is required to be closely attuned to the diverse and shifting customer tastes and needs. Manufacturers are expected to further segment the bakery products market according to the age of the targeting consumer group. The indulgence products target chiefly the adults. In addition to the novelty brands aimed at children, especially in the biscuit and breakfast cereals sectors, manufacturers are also expected to target the lucrative teen’s market. The increase in the population figures of individuals aged over 60 years represents another opportunity for bakery products manufacturers. An example for senior-targeted bakery product is calcium-enriched products to reduce osteoporosis. In-store bakeries are increasingly gaining significance in the bakery products market, especially in the sales of fresh, unwrapped bakery items. In-store bakery activities boosted private label sales in the US and the UK. In certain markets such as Spain and Germany, a majority of the distribution is carried out through independent bakeries and artisanal producers. In such markets, multiple grocery in-store bakeries distribute their part-baked and fresh products on a daily basis through the individual bakery outlets’ network. The success of Western-style bakery products in the emerging markets, particularly in Asia, Eastern Europe, and Latin America, partly depends on the development of supermarket chains in these regions. In certain regions, there is a scarcity of modern distribution systems and modern retail formats are under supplied in rural areas. Small, local producers that serve their surrounding vicinities dominate the markets in such regions. Key market participants in the report include Bahlsen GmbH & Co., KG, BAB Inc., Britannia Industries Ltd., Bruegger’s Enterprises Inc., Einstein Noah Restaurant Group Inc., George Weston Foods Ltd., Grupo Bimbo S.A.B. de C.V, Kellogg Company, McDonald’s Corporation, Nestle, Strauss Group Ltd., The Great Canadian Bagel Ltd., Parle Products Pvt., Ltd., United Biscuits, Yamazaki Baking Co., Ltd., among others. The research report titled “Bakery Products: A Global Strategic Business Report” announced by Global Industry Analysts Inc., provides a comprehensive industry overview, market trends, product overview, product innovations, recent industry activity, and profiles of market players worldwide. Analysis and overview is provided for major geographic markets, such as US, Canada, Japan, Europe, Asia-Pacific, Latin America, and Rest of World. Market analytics are provided in terms of value (US$) for product segments including Bread/Rolls, Morning Goods, Cakes/Pastries, Savory Biscuits, Sweet Biscuits, and Other Bakery Products. The study also provides historic data for an insight into market evolution over the period 2003 through 2008. We’re living in a world of growing environmental concern. It’s not just the individual conservationist trying to save the planet anymore; businesses of all sizes are becoming more eco-conscious. The green movement is gaining momentum and if you haven’t begun considering long term sustainability solutions, now’s the time. But what does it even mean to ‘Go Green’? Understanding the concept can be difficult, and developing and enacting a plan can be downright daunting. Luckily there’s one area where bakery operators can make a clear and immediate impact: energy efficiency. Assessing and addressing your businesses’ energy consumption will not only benefit the environment but you as well. The less energy and fewer resources your equipment uses the less money you spend – and that’s always a good for your bottom line! In general, the equipment with the greatest potential for energy savings in your bakery today is your oven. Highly efficient Vapor Tube Stone Hearth Deck Ovens can boast a fuel consumption savings of 60% to 75% over traditional revolving tray ovens. This is accomplished, in part, with a firebox made entirely out of oven brick and by encasing the Vapor Tube heat distribution system in poured cement. This gives the oven the ability to retain tremendous amounts of heat so that when the burner shuts down the oven can continue to provide an even temperature. 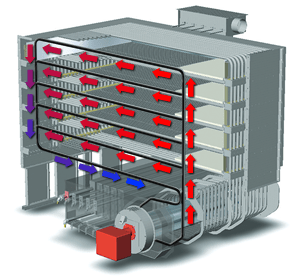 This residual heat allows the burner to fire less often resulting in a significant fuel savings. When replacing that old revolving tray oven with a newer Vapor Tube Deck Oven, you’ll experience more than just significant fuel savings. Modern Stone Hearth Deck Ovens utilize 3-phase electric allowing them to use far more efficient exhaust systems than their single phase counterparts. In addition, the lack of rotating trays means one less motor to power altogether, which translates to a significant electrical savings. Water consumption is also an energy efficiency concern. A quality Stone Hearth Deck Ovens that utilize a self-contained steam system is able to maintain a 99% steam retention rate – far greater than that of an oven utilizing a traditional remote boiler system. These remote systems tend to purge condensed steam frequently consuming both more water and fuel – a highly inefficient process. 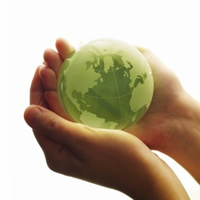 Emerging and evolving technologies also play a role in the green movement of the modern day. As an example, Vapor Tube Technology may be of particular interest to the energy conscious baker. In a Vapor Tube oven, a single indirect burner heats the sealed vapor tubes turning the contained water into steam. The steam then circulates through the tubes by natural thermodynamics, radiating its heat evenly before condensing back into water and circulating back to the heating camber. These Vapor Tubes deliver heat evenly throughout the baking zone with no fans or moving parts necessary to distribute the heat. This provides consistent quality from front-to-back, side-to-side and deck-to-deck with no damper or airflow adjustments. Perhaps the biggest obstacle to environmentally friendly initiatives is perceived cost. For some businesses, the price tag on a brand new Deck Oven can be intimidating. The key to going green however is considering long term sustainability over the short term impact. What will you return on investment be 1, 5 and 10 years from now? How will those energy savings help you both now and into the future? Crunch those numbers and compare your financing options to your expected energy savings. You may find that you can actually save more in energy costs than the lease payment itself, allowing you to actually return money to your bottom line! ‘Going Green’ does not have to feel like an overwhelming undertaking. As you can see from our example, selecting the right energy efficient equipment can provide significant savings to both the environment and your pocket! If you have questions or just don’t know where to start talk to a trusted equipment supplier. They can help you investigate an energy efficiency program that will not only help you ‘Go Green’, it will also help you save green! Empire Bakery Equipment has been helping bakeries of all sizes succeed for over 35 years through measured efficiency in labor and fuel consumption. We have a proud tradition of quality, reliability and superior customer service. 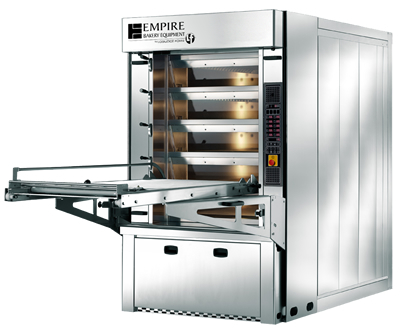 Contact us today to find out how a quality Deck Oven from Empire can help you maximize your profits through production and energy efficiency! Sheeting dough by hand is a strenuous job when working in a bakery. And once again, time is money. 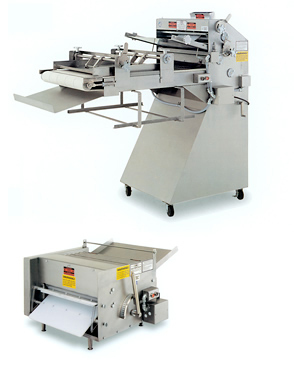 Save time, labor and money with an easy-to-use Dough Sheeter to process your dough. There are several manufactures of sheeters including Acme, Bloemhof, and Rondo to name some of the more popular ones. 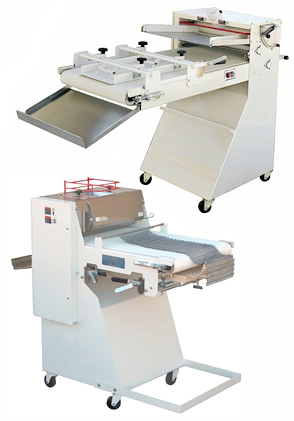 There are a variety of sheeter makes and models, each of which is designed for a specific function. Call Horizon Equipment for assistance in selecting the right sheeter for the application you have. The right equipment makes all the difference in the success of your bakery business. If you are in the market for a new sheeter or have one that has years of service, it is very important to maintain and repair it with proper parts and supplies. Horizon Equipment can assist with all your parts and service needs as well. If you already own a Dough Sheeter, let’s take a look at some of these key equipment parts to make sure your equipment is up and running at its top performance. Dough Sheeter Belts. There are several different types of belting material used on sheeters. There are rubber, nylon, Teflon and even natural fabric or cotton belts used on sheeters depending on the application. There are even specialty and custom belts for those great items your plan to produce. Some belts are connected by glue, while others have stainless steel clipper lacing. Just take a look at your belt and get familiar with the ins and outs of your Dough Sheeter. How will I know if my sheeter belt is worn? When your sheeter belt is worn, you will see frayed edges or it might be splitting and will start to fray. Sheeter belt edges fray when your Dough Sheeter is not tracking properly. This is the time you want to call and get a new belt. It’s also a good time for a tune-up to adjust the tracking. Schedule a maintenance tune-up for your bakery equipment at the same time. Our Service Team will install your new belt and have you up and running in a flash. You do not want to wait until material off the belt ends up in your product for your customer to find! You might not know what type of belt your Dough Sheeter has, but knowing the make and model of your bakery equipment is the first step in getting the correct part. Being familiar with the material is also a great piece of information. This information is important to pass on to our Parts Team so they order you the correct piece. It’s possible one of your Dough Sheeters has one type of belt, while the other has a different kind. It does matter which belt goes to which machine, so be observant. A common problem with many sheeter operation issues is that someone has replaced the belt with something different than what was originally supplied with the equipment. Another important piece of information to provide our Parts Team in assisting you with the right choice for your sheeter belt is the width and thickness of the belt and the overall length. Sheeter Scrapers. Sheeter scrapers keep the roller clean as the dough passes through. As with Dough Sheeter belts, there are several types from plastic to blue steel, to stainless steel. As they become worn they should be replaced so they don’t damage the sheeting rollers. One very expensive replacement part on a sheeter is the sheeting rollers, so protect them by changing the scrapers. Our parts experts can assist you in getting the right replacement scrapers for your sheeters. Chains, sprockets and other moving parts. Inspect, clean and lubricate to prevent unnecessary wear on moving parts. Electrical. Be sure to inspect and replace any electrical cords or safety switches that are not functioning properly. 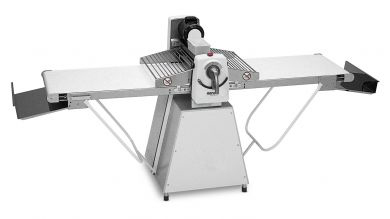 A sheeter is actually one of the more dangerous pieces of equipment in the bakery, so make sure it is up to code for your sake and the sake of your employees. Have a qualified equipment Service Technician examine and make any necessary repairs if you are not comfortable in doing it yourself. Safety first! Once your Dough Sheeter is tuned-up and ready to roll (literally), you can continue making your baguettes, mini croissants, pasta, and pie crusts to enjoy! With proper care, your Dough Sheeter can last for many years! 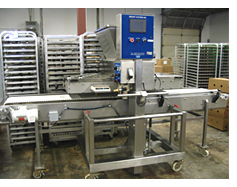 For equipment and parts for your Dough Sheeter, contact Horizon Equipment atwww.horizonequipment.com or (800) 394-4674. Horizon Equipment has a great team of Service and Parts Specialists ready and willing to help you choose the proper belt or other parts for your bakery equipment. We make it easy by providing maintenance tips to optimize the performance of your equipment to keep your bakery business running. In recent months we have talked about plugging the profit leaks in your bakery and increasing the customer’s perception of value – the “Wow Factor” in your bakery products. During these discussions we have referred to the role that automation plays in today’s bakery production. This month we are going to discuss the key issues to be considered for developing an automation plan. Automation has always played a role in baking. After all every bakery has an oven. In recent times excavations around the pyramids of Egypt revealed a large bakery complex with rows upon rows of stone ovens. Hundreds of bakers worked these ovens daily to feed the work gangs that built the pyramids. In today’s high tech world there are a wide range of bakery products, from Wonder Bread to Twinkies that are produced with fully automated processes. There is growing pressure to automate more bakery products. The push to automate stems from the general shortage of labour available to work in bakeries, the increasing cost of labour, and the growing cost of injury claims due to repetitive stress injuries. Advances in automation also cut costs and improve sales by providing consistent ingredient portioning, and consistent taste, texture and presentation. Determine your reasons to automate As mentioned above there are many benefits of automation. Ask yourself what benefits are the most important to you at this particular time. If reducing personal injury claims is your primary concern then determine the processes that are causing the most stress and the highest incidence of claims. solves one problem also provides benefits in another area. In many cases the main objective of automation is reducing labor costs and increasing production capacity. The question that has to be answered is whether or not the machine will actually achieve the labor saving or productivity gain that is anticipated. For example you may buy a machine that allows a decorator to finish 600 cakes per hour. Without the machine the decorator may only be able to finish 60 cakes in an hour. In this situation the machine gives you the possibility of either saving labor costs or taking on new orders without adding to your labor pool. Taking on new orders will give you the highest return on your investment. After all, the machine allows you to sell 10 times more cakes with the same labour pool. In our example this is 600- 60 = 540 cakes per hour or 4320 more cakes in an 8 hour day. Say you sell each cake for $2.50 and your ingredient cost is $1.00. When you sell all the extra cakes you will increase your profits by 4320 x $1.50 = $6480 per 8 hour day. Assuming 250 working days per year the increase in profits is $1,620,000. to be upgraded with additional staff and/or additional equipment. The important point here is to determine how much overall capacity you need to run all your products and to ensure that each individual process has the sufficient capacity. It is important to note that you do not want a balanced plant where each process has the same capacity as the other. In most bakeries the mixing capacity will be greater than the oven capacity and the finishing or decorating capacity will also be greater than the oven capacity. 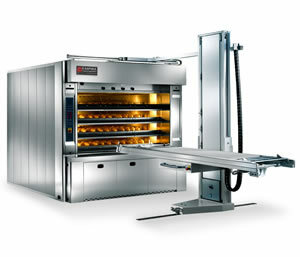 The reason for this is that the oven capacity is usually sets the limit of the overall capacity of the bakery. You never want to “starve” the oven of product to be baked so you build in some protective mixing capacity into your automation plan. There are different levels of automation. The first level of automation involves single purpose machines that require staff to operate. At this level machines will improve the productivity and reduce the physical stress on an individual. At the highest level of automation systems are employed that perform multiple steps in a process and require relatively few staff to operate. These systems greatly reduce manual processes and can usually be programmed to run a variety of recipes within a product category. An advanced automation system will generally employ a conveyor system to move products from one process to another saving time and handling costs. operator and maintenance training, customer service and preventive maintenance programs will ensure that your equipment performs to its potential. In short you are looking for a vendor to become your partner in growth and innovation. Routines — daily, weekly, monthly, annually. We all have them. Whether you walk your dog in the morning, have a play date every Saturday, or frequent the same restaurant, you have a routine. When our schedule is altered, our whole day can be affected. For example, you have gone to the same coffee house, bakery or café for your coffee, ice tea or soft drink every morning as part of your routine. Today, something tastes different, not quite right. You wonder if there is a new employee or maybe they forgot to put on a fresh pot for you. Maybe they changed brands? Or maybe, they just haven’t changed their water filter in the beverage dispenser in over 6 months! 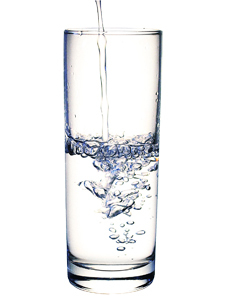 Water is often challenging to filter and can vary due to its source. Seasonal variations can often impart new challenges in a process that has historically run smoothly. This is why 3M has developed an extensive range of filters that deliver exceptional dirt-holding capacity and high flow rates to assure the quality of water used in the production of beverages. 3M filters address the challenges of improving clarity, taste and odor as well as bacterial removal. When you optimize your foodservice equipment with a 3M water filter, you help reduce contaminants that affect the taste, smell, and the overall water quality for water coolers, coffee, tea & vending. You gain brilliant clarity, exceptional taste and extend the life of your equipment — exchanging your water filter on a regular basis will reduce unscheduled service calls associated with corrosion, sediment and scale build-up. Changing your water filter regularly in your bakery equipment [proofers, boiler, rack ovens] as well will also reduce maintenance and increase energy efficiency by reducing hard scale build up. Your crusty breads, bagels, and other baked goods will look and taste better. Your customers will keep coming back for more! 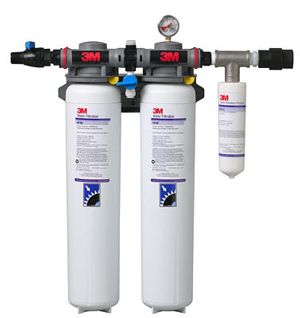 3M Purification products can be configured to meet the flow rates from small production up to large scale, high capacity production plants. Successful businesses are created with smart business choices. If you find yourself in need of a water solution for your equipment, or more information, call Horizon Equipment at (800) 394 – 4674 — we are the water filter experts! Our helpful Sales & Service Team will get you on the right track to a clean and clear way of equipment life! Last month we talked about maximizing the profit on the products that run through your ovens. This month, we will discuss inconsistent depositing before baking. run but add that up over a year of full production. Methods where each deposit has to be measured or scaled are usually the most inconsistent. In these situations the tendency is to over deposit to make sure that the final product weights are no less than the label weight on the package. The result is a direct hit on profits. After-all the baker can not charge for any of the ingredients that are over deposited. Improving the accuracy of the depositing system allows a baker to hit the label weights more accurately and virtually eliminate the profit leak from over depositing. The first step in improving accuracy is to improve the scaling of ingredients. Modern day premixes go along way to making scaling more accurate. However there many bakeries that still make products by the “scratch” method. Some of these ingredients are premium high cost items. When these high cost items are over deposited the profit leak can be substantial. An easy example of over portioning could be filling Cream Horns or Cannoli’s with a pastry bag. The typical method would be to use a pastry bag and “Eye Ball” the amount or just stop when you feel it’s right. A few problems arise here. Number one, if your Cream Horns or Cannoli’s are inconsistent in size, filling each one will take a different amount of filling. The second problem is obvious; filling these pastries by just “Eye Balling” the amount will almost always result in over filling. Multiply these inconsistent weights throughout the week, then throughout the year, add this up and see where you’re at with ingredient costs. Solution — replace your pastry bag with a small single piston depositor. This way you can accurately fill each pastry with the exact amount of filling that you budgeted for in your costs. Now you can price your Cream Horns and Cannoli’s properly by having an accurate cost of ingredients on each one produced and sold. One concern with automated depositing solutions is the risk of damage to the product being deposited. Damaged product can lead to rejects or rework. Both of these problems cut into a bakery’s profits. These profit leaks can be prevented by choosing the right kind of depositor. There are a number of different depositing methods to choose from: Gear pumps, sine pumps, double auger systems, and piston fillers. The key is to choose the best solution for the product being deposited. Bread and cookie or pie crust dough usually work well with double auger systems like the Vemag machine. Gear pumps like the Edhard pump handle donut fillings and some icings very well. And Piston fillers from from companies such as Hinds Bock, Unifiller and Megart work particularly well with batters, icings, mousses, and other flowable products. “The beauty of piston fillers is that the product is transferred by way of a vacuum process. This means that the product in the hopper of the depositor will not change during the depositing process”, says Bruce Williamson of Megart System in Toronto, Canada. ” Bruce also adds, “When choosing any form of depositor, look for one that is easy to use and set-up, easy to clean and easy to maintain. Accurate depositing is not just a matter of repeating the same weight or volume with every shot. Accurate depositing is also a matter of hitting the target every time. Trailing batter or fillings over pans during depositing can lead to rejects after baking or to higher labor costs to clean pans for the next round of depositing and baking. Hitting the target is particularly important when it comes to icing cupcakes. Most cup cakes are sold in clamshells of 6 or 12, or in flat pack boxes of 24 and up. The most efficient way to ice these cup cakes is to ice them in the clam shells or flat packs. After icing, cupcakes can be further decorated with sprinkles, confetti candy or chocolate and caramel drizzle. With ingredient prices at an all time high, customer expectations increasingly demanding and labor costs rising, examining your post oven production is a great way to close the profit leak and put some cash bash in your pocket. Megart Systems designs and builds single and multi-piston depositors for fast, easy accurate scaling of a wide variety of products for unique and diverse bakery applications. Have you ever had to purchase casters for your new or used bakery equipment? You might have found it confusing because there are many elements to consider when buying the right casters for your equipment. Price, size, type and so on. As well, would there be a negative impact on your equipment if you purchase the wrong casters? And remember, “you get what you pay for”, so cheaper doesn’t always mean better. WHAT ARE CASTERS USED ON? Baking oven racks, proof racks, storage racks, bakery dough troughs, griddles, and other high temperature bakery applications. Keep your casters and equipment clean. Check for food and debris on a regular basis for optimum productivity. Look beyond the wheel and inspect the nuts, bolts and other parts inside for wear and tear or to remove excess matter. Encourage your bakery team to keep a cleaning and maintenance schedule. Check your wheels – When using polyurethane wheels, poor maintenance will lead to the material becoming embedded in the wheel while causing damage of the wheel tread. Not only will your casters suffer, but your bakery equipment and floors could suffer as well. Tighten up your bolts and keep your parts well lubricated as instructed. If damaged, you should look to replace your casters and wheels as soon as possible. Contact Horizon’s Parts Department for replacement casters and wheels. There are several negative issues that can arise if you purchase bad casters. Kiss the money you saved up-front goodbye. Your bakery equipment, business and employees will suffer if you purchase bad casters. Bakery racks that bounce across a hard floor on rough wheels tend to crumble. Choosing too soft of a wheel can also limit your equipment load. Use the proper lubrication for right application. High-temp grease for your oven racks and food-grade grease for your transport racks will protect your equipment and floors. Your employees’ safety is first. Prevent injuries by enforcing regular and proper maintenance. If your equipment parts are maintained on a regular basis and not mistreated, you will get the maximum safety and service performance from your casters. Never drop heavy loads on the equipment. Never subject the equipment to operation at high speeds. Swivel casters turn more easily under load, reducing starting effort and fatigue, and allow a more consistent level of output. Floors are expensive to repair or replace. Poor casters damage floors and poor floors damage casters, reduce productivity, and are hazardous in your bakery business. Are your transport cabinets and bakery racks leaving nasty tracks on your vinyl tile floor? Is the surface of your casters starting to wear, leaving nasty track marks? Assess your floors and check your casters to make sure you have a good match. In the December article of The Bakery Network Knead2Know newsletter, “Bringing the Heat”, the focus was on ovens and even calibrating your oven. We would like to dig deeper and give you some additional preventative maintenance tips to keep your oven running for many years to come. Burner Adjustment: Clean and take apart the burner as it usually gets filled with flour or dust. Checking the gas pressure is also important. If there is not enough gas, it will take too long to bake. If there is too much gas (your flame will be a yellow in color), that creates soot; soot causes cracking. Temperature Calibration: Check your bakery oven temperature on a regular basis. Communicate with your staff as your bakers might be used to baking at a certain temperature. Your bread which used to bake perfectly at 380° might now be too done if your bakers are not aware of the recent calibration! Heat Exchanger Inspection: Check for defects, cracks plugged ports or any other signs that the integrity of the heat exchanger has been compromised. If damaged, this causes your bakery oven to be inefficient, wastes energy and is unsafe for employees. Horizon Equipment has a great team of service and parts specialists ready and willing to help you choose the proper caster for your bakery equipment. We make it easy by providing maintenance tips to optimize the performance of your equipment to keep your bakery business running. For more information on choosing the correct caster, check out our Choosing the Proper Caster documentation on our website or visit www.horizonequipment.com. Save 15% when you mention promo code CASTERS2012 on your next caster order before March 21, 2012. Need assistance with Service and Parts? Visit Horizon’s Service and Parts Department page for friendly professional support or call us at (800) 394-4674.